large brown onion, peeled and diced Archives - Adelaide Central Market: The City of Adelaide's premier food destination. Over 70 traders under one roof. Pre-heat oven to 200 ̊C (180 ̊C fan-forced). Place whole potatoes, (skins on) in preheated oven and cook for 1 hour. Remove from oven and allow to cool for 5 minutes. Halve each hot potato and scoop out flesh into a bowl, discarding skins. Using a potato ricer, mash potato into a clean bowl. Whilst still warm, add yolks, parmesan, salt and nutmeg, mixing until well combined. Add flour and gently knead mixture to a smooth dough, on a clean lightly floured surface. Evenly divide dough into four pieces and roll each into 2cm wide sausages, dusting with extra flour. Lay sausages side by side and using a knife cut gnocchi into 2cm pieces. To shape gnocchi, use a gnocchi board or fork to create grooves on one side and an indent on the other, to help the sauce coat the gnocchi. For the sauce, melt butter in a large frying pan over a low heat. Add onion and garlic, cover and cook for 10 minutes, until onion is soft. Add stock, increase heat to medium and reduce by half. Add cream, gorgonzola and spinach, stirring until cheese melts and spinach wilts. Season with salt and pepper. To cook gnocchi, bring a large saucepan of salted water to a gentle boil. Carefully place gnocchi in water and cook for 2-3 minutes or until gnocchi floats to the top. Using a slotted spoon remove from pan and add to sauce, tossing gently to coat. 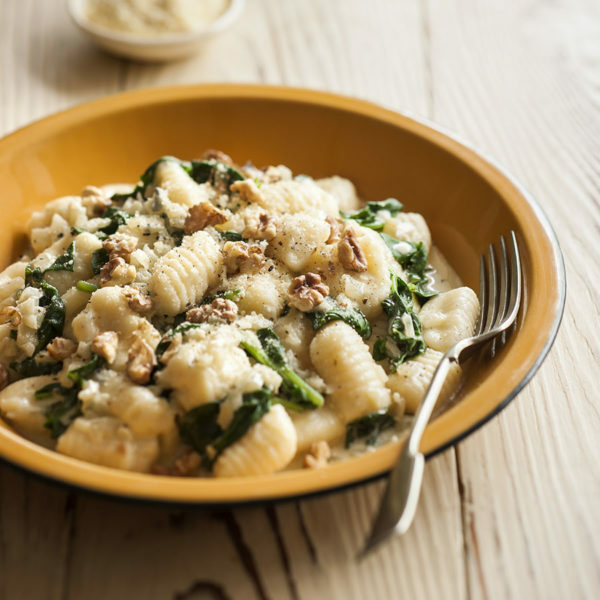 To serve, sprinkle over toasted walnuts and grated parmesan. *NOTE – there are two types of gorgonzola, dolce and picante. Dolce is sweeter, younger and milder in flavour with a creamy texture. Picante is sharper, aged and stronger in flavour, with a crumblier texture. 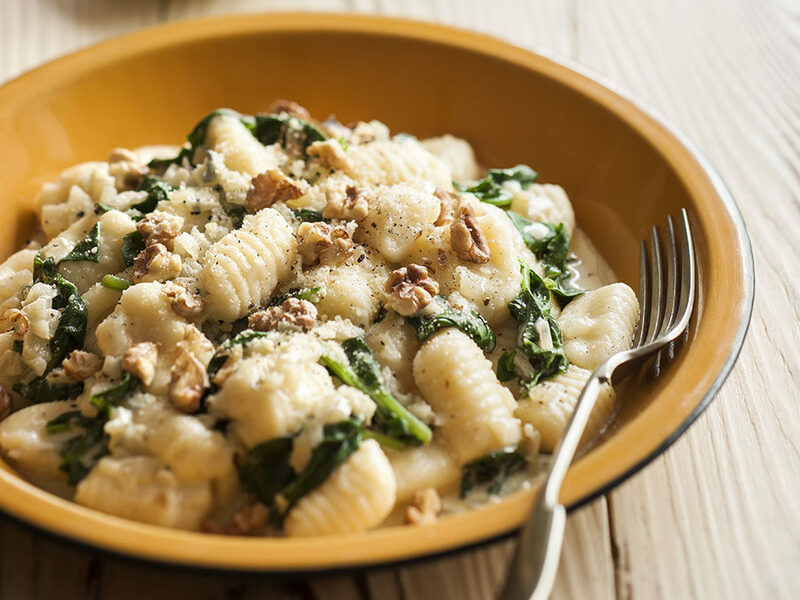 To serve, sprinkle over toasted walnuts and grated parmesan. *NOTE – there are two types of gorgonzola, dolce and picante. Dolce is sweeter, younger and milder in flavour with a creamy texture. Picante is sharper, aged and stronger in flavour, with a crumblier texture.